This antique postcard caught my eye. 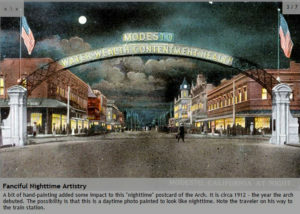 The message of the historic Arch that still spans 9th Street located in Modesto, California, is relevant to a good long life: “Water, Wealth, Contentment, Health”. In celebration of the construction of an irrigation system for the nearby farmlands back in 1912 (almost a century ago), the towns folks christened the Arch using a bottle of water collected from the new canal. The canal carried water from the Sierra Mountains to grow and sustain the agricultural prosperity of Modesto. The crops currently grown within the greater Modesto area include almonds, walnuts, beans and rice … part of a healthy diet. The commercial crop harvest of Modesto helps to sustain healthy plant-based diets (nuts, whole grains such as oatmeal, beans and soy products) including those of the residents of Loma Linda, located over 300 miles to the south of Modesto. Loma Linda has the only Blue Zone designation in the United States. Many of Loma Linda’s residents are 7th Day Adventists. They follow the healthy lifestyle endorsements of the Adventist Church Founder, Elizabeth G. White and others. We particularly like the one about drinking only pure water. Similar to the other worldwide Blue Zones that are located in mountainous areas, Loma Linda receives its water from the melting snow of the San Bernardino Mountains. Tumbling water over rocks can make the water more active (bubble delivery of oxygen, hydrogen and electrons to the water). One of the longevity secrets of Loma Linda seems to be spiritual-based with gratitude to a higher caring being. Additionally, retirement does not seem to exist for many elders. If they no longer have jobs, many will volunteer their time to help others. In 2002, the Adventist Health Study researched the lifestyles of over 96,000 men and women of varying ethnicities. The study found vegans tended to weigh less than those who eat meat but vegans did not live the longest. “Pescatarians” who ate a plant-based diet with at least one daily serving of fish, had the distinction of living the longest according to this study.